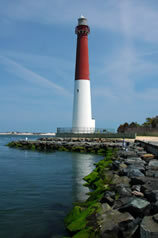 The Barnegat Lighthouse is an iconic feature to the Jersey Shore and lies in the heart of the Barnegat Bay. The area of land surrounding a body of water is known as that body of water’s watershed. For example, the entire area of land surrounding the Barnegat Bay is known as the Barnegat Bay Watershed. This area is comprised of all 33 municipalities of Ocean County, as well as 4 municipalities in Monmouth County, and home to over 500,000 people. Some of the major rivers entering the Barnegat Bay include the Metedeconk River, the Toms River, and the Forked River, and smaller rivers include Cedar Creek, Oyster Creek, Mill Creek, the Westecunk Creek and the Tuckerton Creek. The Barnegat Bay Watershed also includes the ever popular Jersey shore, which includes many popular summer tourist attractions including Long Beach Island and the Barnegat Lighthouse. The first group of people to inhabit Ocean County was the Lene Lenape Indians, who survived off the natural bounty of fish, shellfish, and native animals and vegetation that the Barnegat Bay Watershed had to offer. Towards the late 1800’s and early 1900’s, Ocean County started to develop as a popular tourist location, bringing people from many different regions to come enjoy the waterfront activities provided by the Atlantic Ocean and the Barnegat Bay. Between the 1940’s and the 1990’s, the population of Ocean County grew from approximately 38,000 people to approximately 400,000 people, and from the years 2000 to 2009, the population of Ocean County saw a rise of 11.7% in population, the largest population growth of any county in the state for that time period. With an increase population comes a demand for development, and between the years of 1990-2010 over 60,000 residential units were authorized by permit in Ocean County, the most of any county in the state. With such an increase in development, the natural environment of the watershed took a toll, with more than 70% of the riparian buffer zone developed and approximately 45% of the shoreline bulk headed. 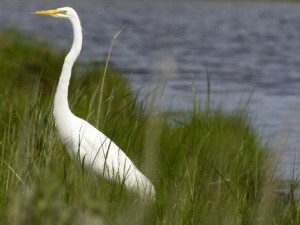 The Great Egret is a common bird of the New Jersey Shore, living in estuaries and bays where it has a wide variety of food sources. Although there has been a large amount of increased development within Ocean County over the past decade, much of the state has been preserved through open space and State Parks, Forests and National Wildlife Areas. In 1998, Ocean County started the Ocean County Natural Lands Trust Fund Program, preserving nearly 800 aces of land in Ocean County every year since its inception, with a combined total of 11,804 total acres preserved as of 2011. Another Ocean County run land preservation program is the Ocean County Farmland Preservation Program, which has worked to preserve 49 farms and over 3,000 acres of farmland in Ocean County. The Ocean County Department of Parks and Recreation also protects more than 4,000 acres of land in 24 parks to be used by the public and as open space. The Edwin B. Forsythe National Wildlife Refuge also protects 21,000 acres of land in Ocean County within the estuaries and along the coast.